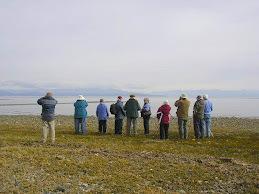 The Sunday bird walk went to the Englishman River Estuary, Plummer Road side in Parksville.. The morning was sunny and warm with a cool wind blowing off the Strait of Georgia. 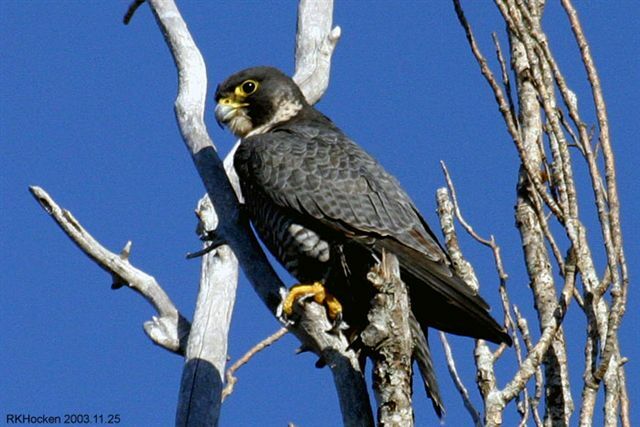 The highlight of the morning was the sighting of a Peregrine Falcon as it flew over us at the waters edge. We watched as it flew to the mudflats, pick up a shorebird and headed out of sight to feed on the prey. Eighteen birders, including a birder from California saw and heard the following thirty-eight species: Canada Goose, Common Merganser,, Common Loon, Great Blue Heron, Marbled Murrelet, Bald Eagle, Peregrine Falcon, Northern Harrier, Turkey Vulture, Killdeer, Semipalmated Sandpiper, Least Sandpiper, Western Sandpiper, Semipalmated Plover, Black-bellied Plovers, California Gull, Bonaparte Gull, Glaucous-winged Gull, Belted Kingfisher, Black-throated Warbler, Orange-crowned Warbler, Warbling Vireo, Rufous Hummingbird, Northern Flicker, Northwestern Crow, Common Raven, Chestnut-backed Chickadee, Bewick's Wren, Willow Flycatcher, Cedar Waxwing, American Robin, Swainson's Thrush, European Starling, Black-headed Grosbeak, Spotted Towhee, White-crowned Sparrow, House Finch, and American Goldfinch. Peregrine Falcon: Ralph Hocken .Photo. Five American Black Ducks were seen at the Cottonwood Golf Course in south Nanaimo. A Great Horned Owl was seen along the East Wellington Overpass on Highway 19, in Nanaimo. Sunday Bird Walk on August 04 will be going to Bowen Park in Nanaimo. We will meet at the bird store at 9:00 a.m. or at 9:20 am in the parking lot at Bowen Park near the bowling green off Bowen Road.